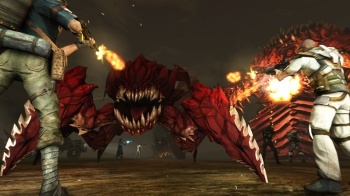 Players of Trion Worlds' latest MMO have killed over 500 million hellbugs. Just one month after launch, Trion Worlds' futuristic MMO Defiance has one million registered users. The multiplatform shooter, which is a companion to the Syfy TV show of the same name, launched on April 2 after being in development for five years. In addition to its million players, Defiance has seen 500 million hellbugs killed as gamers drove 50 million virtual miles on ATVs and fought on one million Arkfalls in under five weeks. As for the television show, Defiance was the Syfy network's most-watched scripted premiere in seven years. Defiance premiered on April 15, and over two million people have watched the three episodes that have aired thus far; the next episode airs on May 6. Though reviews for Defiance were average, calling the MMO "generic" (among other things), that clearly hasn't stopped gamers from taking a chance in the alien-filled apocalypse. According to Trion's Nathan Richardsson, this is "just the beginning of a truly unique entertainment experience." It's much too soon to call either the game or TV show a complete success, but at the very least, it appears that Defiance is off to a good start.